One cute horse... a couple layouts to end the year! Gotta make this fast! 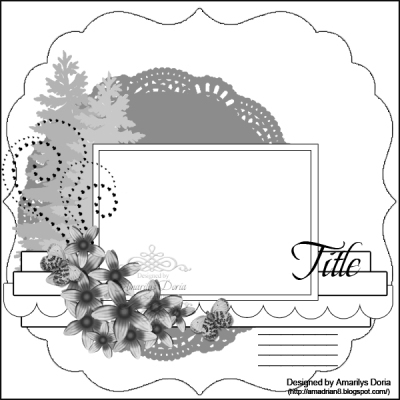 Yesterday, I scrapped this page for Scrap That - I love the use of buttons in lieu of flowers. 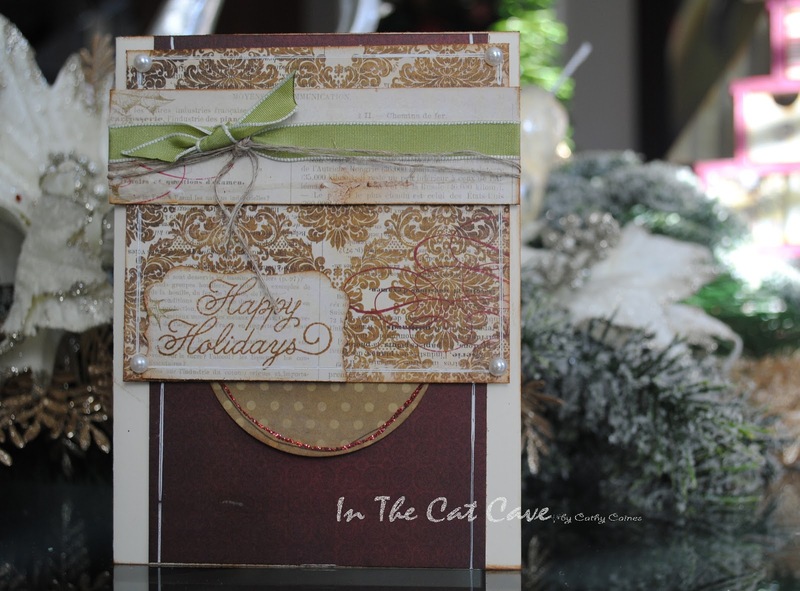 This is largely made from retired Stampin Up products! 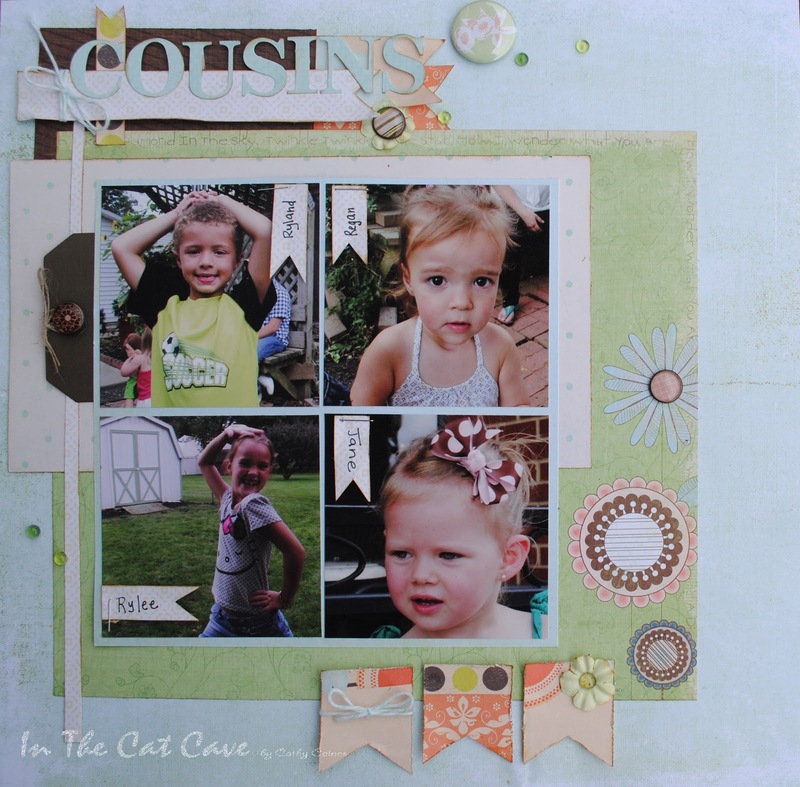 I set out to do the Scrapbooksteals Jade 3 layout... picked out the paper and photos. But then began another layout at the same time. WHAT? I have really got to learn to focus. 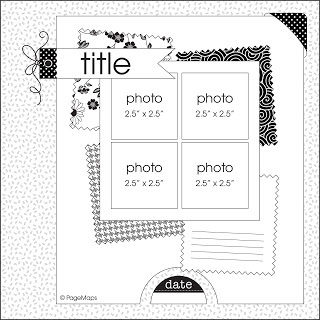 Supplies Used: Authentiqe Enchanted collection AC thickers, 1" SU circle punch, SU pennant punch, Fancy pants Trick or Treat paper collection, whisper white SU cardstock, SU naturals white card stock. Ever since I learned that paper has memory from Becky Fleck, I am forever just using my nail to pop up my banners off the page. It's another way to create dimension. There's a hidden journal tag in this layout - I simply created my tag by punching out a one inch circle and using a corner chomper. 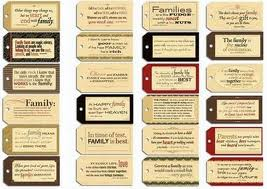 Very easy - make sure those memories are preserved! I struggled to get my title to pop - I landed on thickers because they created dimension but also because the corner was fabulous! Because I had a long title I needed to figure out how to fit it in. I love these tiny type letters (which I used on both layouts today). I popped it off the page using a half circle matching the pennants and journaling tag. Here's the layout I did in the middle of the layout above. It was super quick and easy and was inspired by a couple members of Sketches in Thyme (Anastasia & Lea). I had some fun with the twine and the washi tape but I got serious with my journalling. It's the first time I really did a layout for myself. Its a quick one but I adore it. So real. Supplies Used: Little Yellow Bicycle "The Escape", Stampin Up naturals ivory cardstock, My Mind's Eye Lost & Found 3 (Ruby), Doodlebug loopy love letters, Authentique Enchanted Details, Regal Rose SU ink, and unknown twine. ... I am noticing a lot of sparkle and glitter in my cards these days. :) This is for their weekly challenge, which is anounced every Monday! You still have plenty of time to check out this weeks! 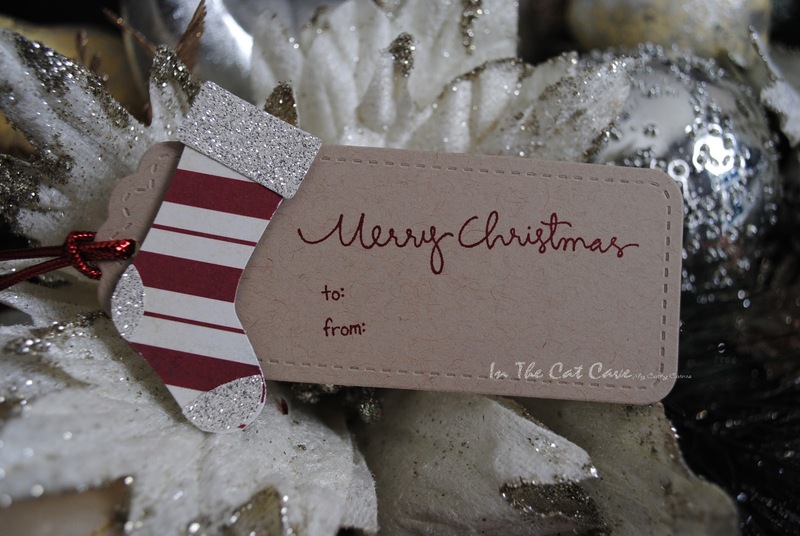 Materials used (All Stampin' Up): cherry cobbler & silver glimmer paper, stocking builder punch, perfect polka dots embossing folder, cherry cobbler & whisper white cardstock and cherry cobbler baker's twine. Here's the sketch if you want to play along! And I didn't stop there... 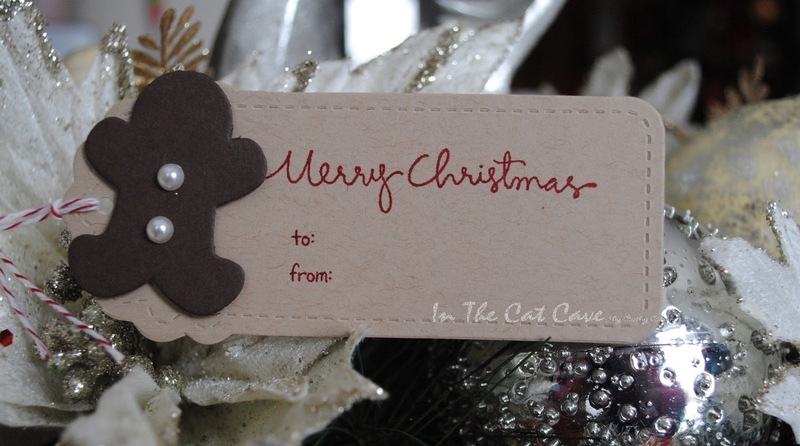 I needed to make a couple Christmas tags and QUICK! So, I grabbed my new holiday framelits from Stampin' Up and cut out a couple gingerbread men - to re-create the same stocking punch tag I had made last week. 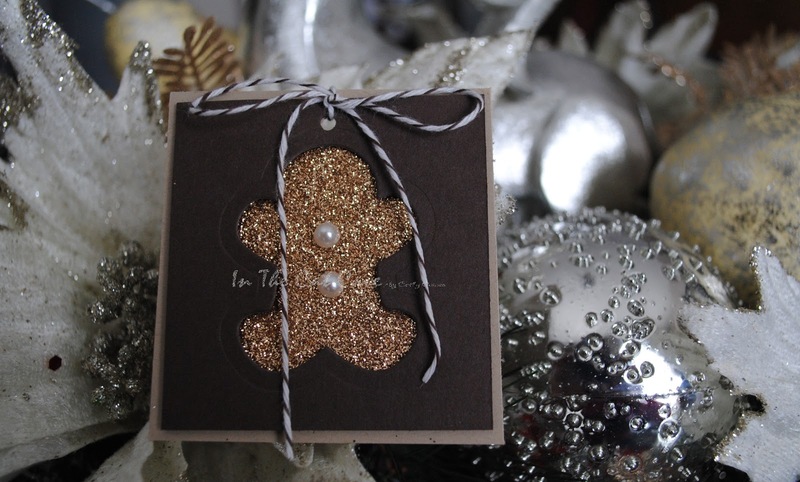 Here's the first gingerbread man tag I did and the corresponding one from the previous week. 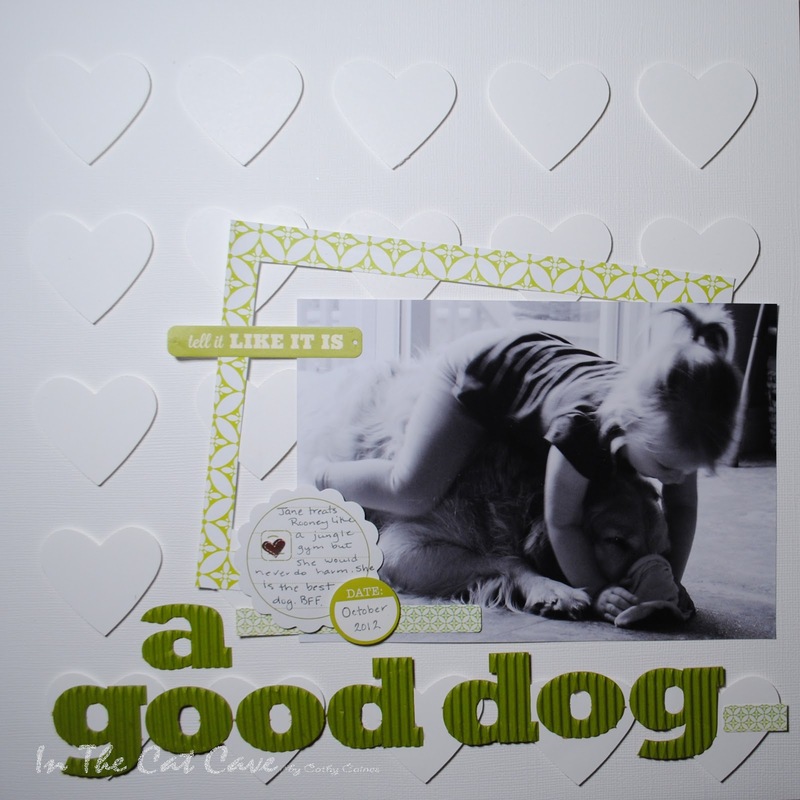 These are made using the Stampin Up two tag Bigz die... I made about twenty different tags but these are my favorite. It turns out I am becoming a minimalist. Who knew! 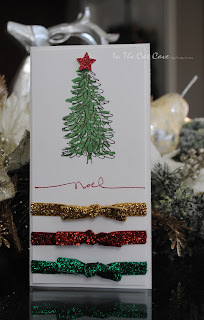 The supplies used for these are the holiday framelits, basic pearls, Christmas greetings stamp set, Sparkly & Bright stamp set, early espresso paper and crumb cake cardstock, as well as cherry cobbler ink. On the stocking tag, the difference is that I used the stocking builder punch and some glimemr paper. The stocking is made some scrap paper but that looks like Fancy Pants Saint Nick collection to me. After doing up those two tags, I realized I shouldn't waste my negatives so I grabbed the champagne glimmer paper and crumb cake (kraft) paper, as well as some baker's twine to whip this up super fast. I added some pearls for some buttons and voila! My other negative was quite a bit bigger so I decided to make it into a card similar to the above. But this time I decided to use my cherry cobbler colored cardstock and glimmer paper.. only thing was I had in mind that I wanted to use this for the Ribbon Carousel challenge # RCC75!! I love these challenges and Ribbon Carousel has a great prize. You have until the end of the month to check it out! 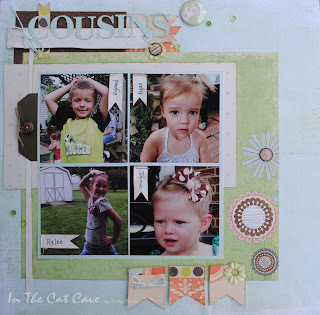 Finally, I did one more tag using the holiday framelit - I plopped that right on the gift... I love how the sparkle just makes everything more festive!!! Supplies Used (All Stampin Up): Holiday Framelits (2012 holiday catalog), Merry Mini Punch pack (2012 holiday catalog), basic whinestones, early espresso baker's twine, champagne glimmer paper (2012 holiday catalog), silver glimmer paper, and the 23/8" scallop punch. That's it for now!! Cheers! Through all the hustle bustle, I managed to get about a dozen tags today, a dozen cards and ten "reindeer food" jars. I also managed to wrap about 5 or 6 gifts. GO ME! 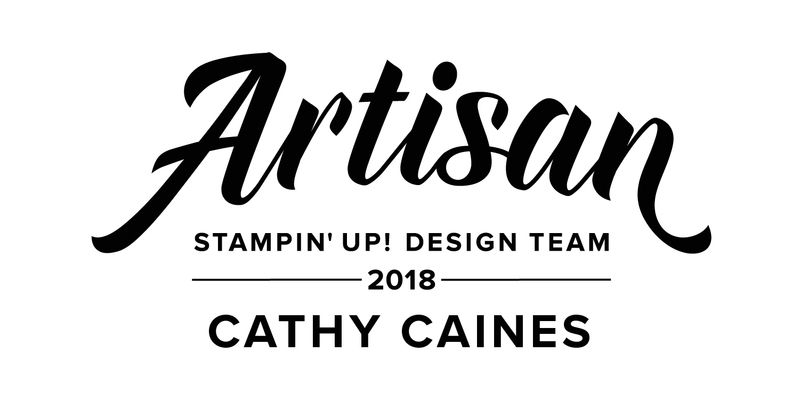 Because I am still not done all my cards, I participated in a few challenges in the blogosphere... By the way, there are some amazing giveaways and posts going on right now. This particular challenge is another yet amazing sketch by Becky Fleck over atPagemaps. Honestly, this card sketch is awesome... I did two cards for this sketch!! Supplies used was all Stampin Up products which includes the Festival of Prints mini paper pad from the Holiday catalog, linen thread, vellum, whisper white paper, cherry cobbler ink, cherry cobbler cardstock, glimmer paper (champagne & cherry cobbler), Merry Mini punch pack (star), quilted cherry cobbler ribbon (retired) and silver mini brads. 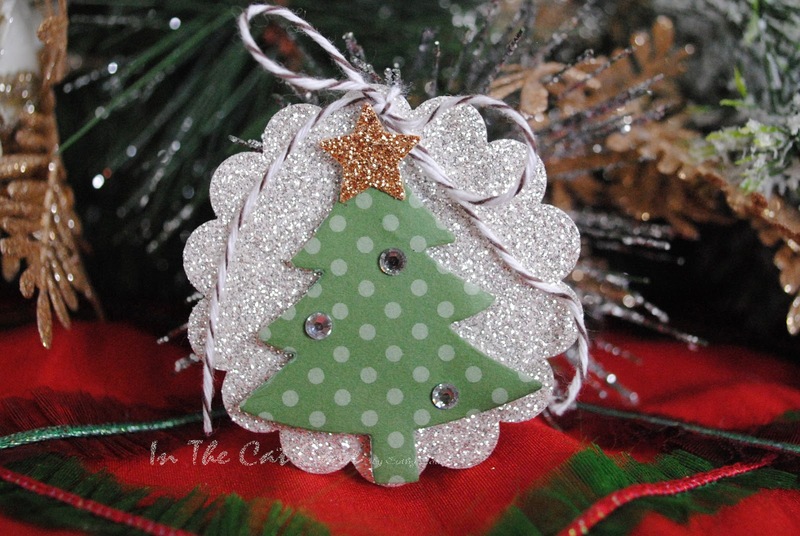 Don't forget to check out the pagemaps blog because Becky is showing 12 days of ornaments. Very awesome!! In the mean time, I decided to also participate in my local scrapbooking store's challenge, which was to use metal. This was PERFECT because I had bought a stamp set and punch pack from the SU holiday catalog called "Merry Mini" (I used the star above). Anyway, I had a vision to created a card by using the mini christmas bulb but I hadn't yet done it. 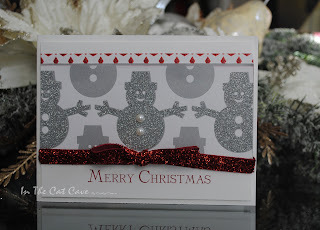 I sat in my craft room thinking I would go with either jingle bells or a pewter embossing powder... But I remembered the wire I got off the clearance rack and got to work. It's so EASY to work with this wire... especially if you have wire cutters and pinchers. Once again, these are are super easy yet SUPER fun. Don't you love them? Supplies used all Stampin Up: Merry Mini punch pack, Merry Mini stamp set, glimmer paper (cherry cobbler, champagne & silver), wire works (retired), cherry cobbler and whisper white cardstock, Christmas Greetings stamp set and Many Merry messages stamp sets, as well as daffodil delight, gumball green and pacific blue inks. Heres the wire I was talking about - do you have any in your stash? 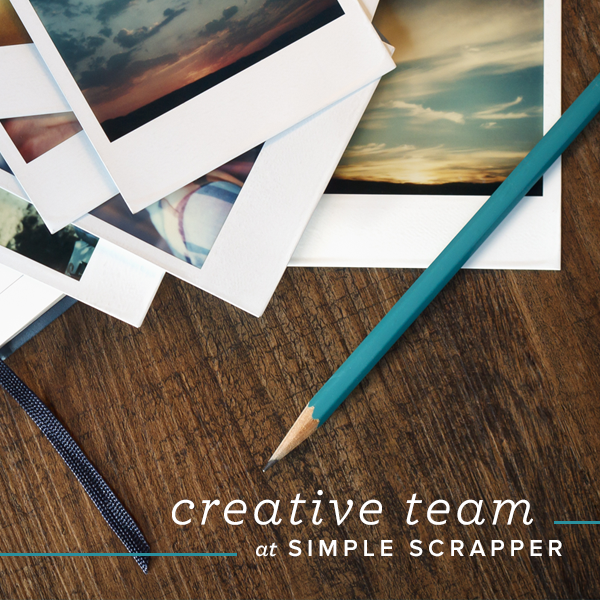 It has come in handy several times this month with different projects. On this layout, to adher the wire, I used my wire pinchers to curl the ends and hold it onto the paper. I then turned it over and just secured it with sticky strip (wonder tape). And finally, I wasn't super happy with the stamped images so decided to use some crystal effects on the Christmas bulbs. This is the same as glossy accents. You can tell from the picture below that it really made a big different. Amazing!! Well, I have other items to post but the baby is sleeping which means its time for me to sleep. Just one card today for the Studio Calico Sunday Sketch. I still have close to 3 cards to be done by Christmas... but the good news is that I have all the cards that need to be mailed sent out! 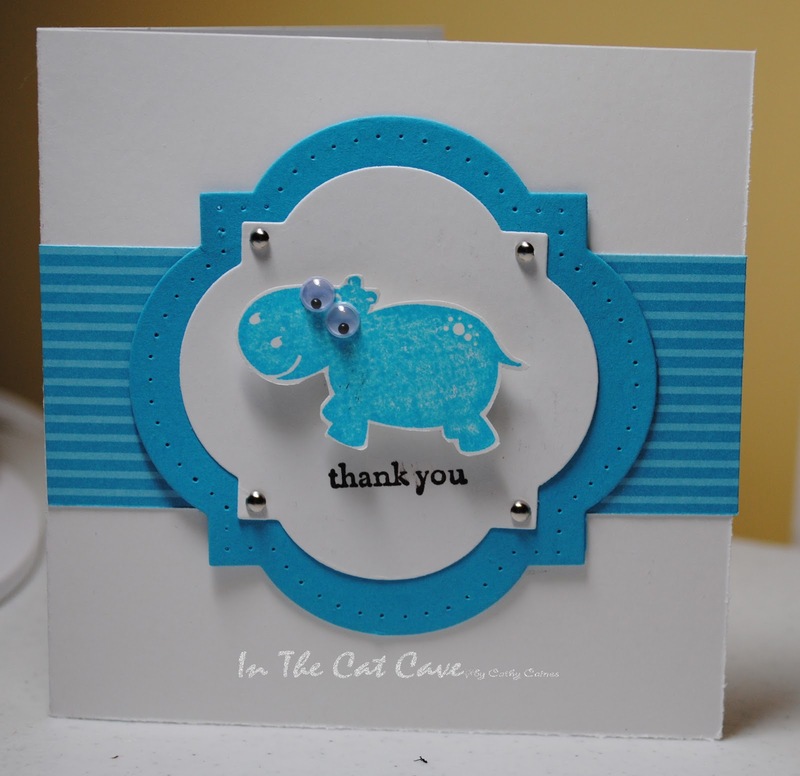 Lately I have just been LOVING Studio Calico!! I placed an order through their website during Black Friday and picked up anything my local scrapbook store had... bottom line is look out for more SC! Loving Mister Huey's these day!!! And of course some jute! The supplies used in this little number is SC Wonderland and Darling Dear collections, as well as Mister Hueys (Leaf Green, Plum Thumb & Gold Shine), AC jute, Moss Lawn chaulk ink and kraft paper + whisper white paper. Can you send me an email to cathywoodman@hotmail.com with your address so I can send you your goodies? Thanks to everyone who dropped by! I found an hour today because both of my children were asleep at the same time. Quite amazing! However, they both decided today would be the day that they will have their own style of tantrums. So both my hubby and I rocked and rocked and rocked. 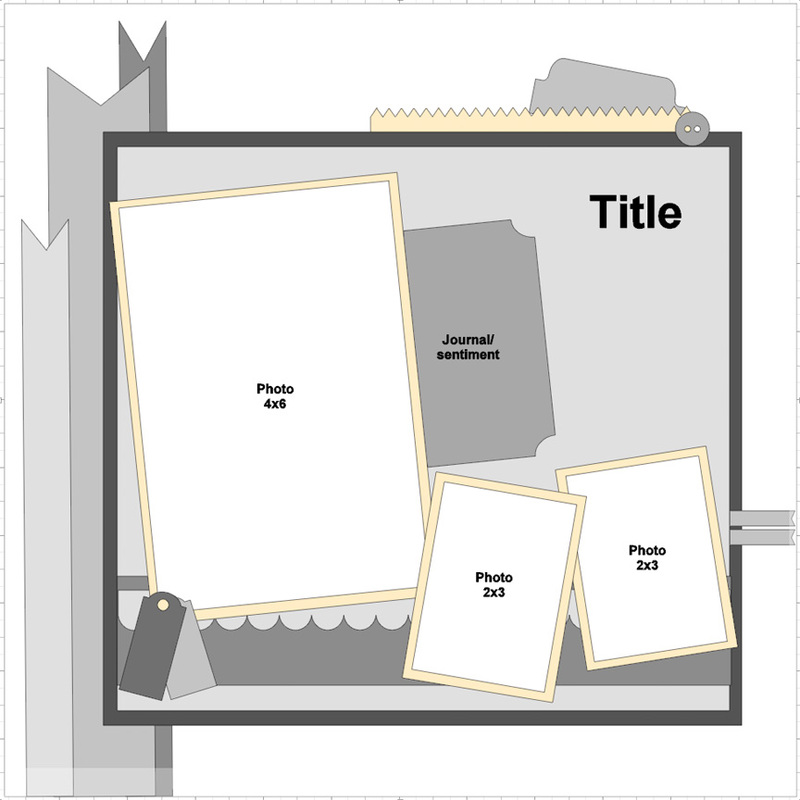 In that hour, I finished a layout for the pagemaps sketch sponsored by My Little Shoebox. Unfortunately today is the last day for this challenge so its likely you are too late. Becky Fleck has lots of things going in her blog like how to make ornaments, as well as a card sketch challenge so be sure to check it out. 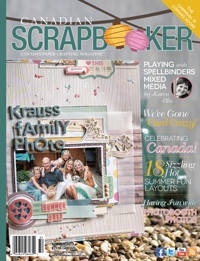 Before I forget, both Canadian Scrapbooker and SCT have big holiday contests that you should also check out. As always, pagemaps finds a way to get me to scrap those photos that I just haven't been able to scrap... These are one off pictures of my daughter's cousins that we have only seen once as they live in Ohio. We miss them dearly and can't wait to visit again with our little boy! Supplies used: Fancypants Baby Be Mind, Fancypants Winterland, Tim Holtz vintage photo distress ink, Kaisercraft alpha stickers "Child's Play", SU baker's twine, staples, AC precision pen, 7gypsies journalling tags, Kaisercraft paper flowers, BG glazed buttons, Robin's Nest dew drops, AC flair, Mister Huey's, and SU linen thread. Did you see the FLAIR? OMG - I LOVEEEEEEEEE it!!!!!!!!! Also, I finally found some of the Robin's Nest dew drops - aren't they fab? On the left, there is a journalling card from 7gypsies about family vacation. On the other side, is some journalling about the fun day we had when these pictures were taken (by a 6 year old... who told me she was ten and asked me all about how babies come out of the Mommy's bellies..). I've mentioned it before and I'll mention it again, journalling is so important and there's no excuse not to. 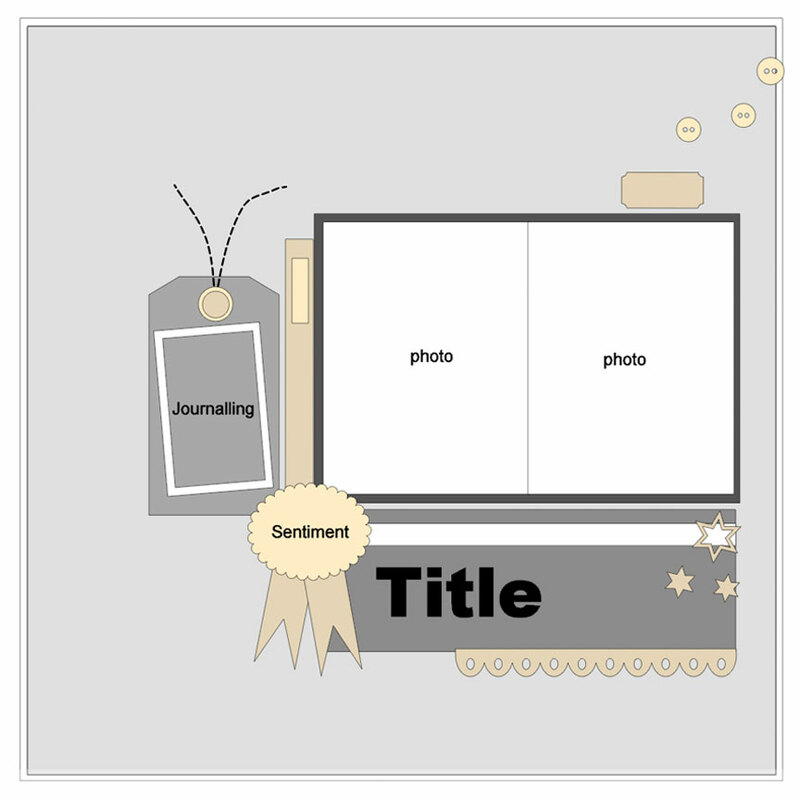 There's so many ideas out there on hiding the journalling if you don't want it on the face of your layout or if you don't like your writing like me! I also included some BG glazed buttons on this layout but they must be adherred by punching a hole in the paper and adherring it with wire. Check out how I decided to do it from looking at the back of my page. You'll also notice that I tape the sketch on the back of the layout - I also write the supplies used. 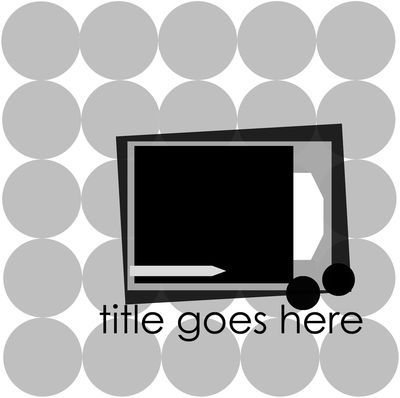 Here's a closer look at the title - enjoy! 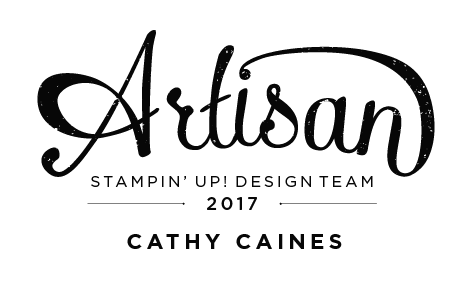 Finally, there's a clearance blitz going on at Stampin Up and there are some amazing deals so if you are interested you should check it out! Hope you are enjoying your "hop along!" You should have come from Julie's blog! I am thrilled to be part of the Scrapbook Steals December Blog Hop! I frequently take advantage of their daily scrapbook deals but I am also a regular in their mid week mojo challenges. 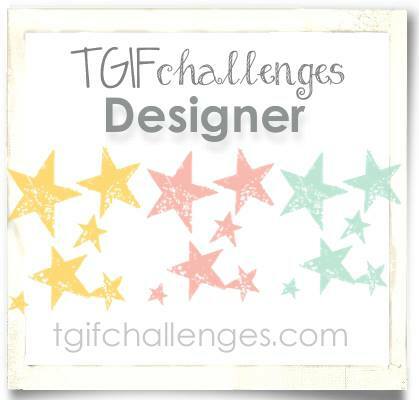 Check out their blog every Wednesday for weekly inspiration! 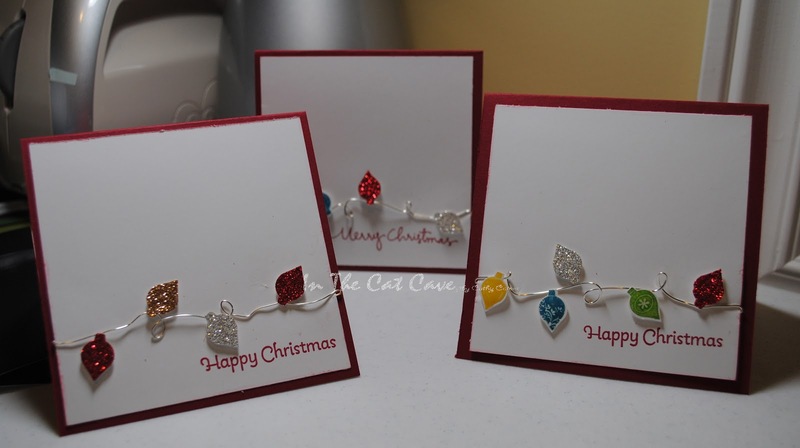 Since we all seem to be in the hustle and bustle of Christmas, I created a set of cards using the American Crafts glitter ribbon. Honestly, who doesn't love sparkle and shine on a card? This ribbon is super easy to use. It's bendable and the glitter does not fly off. The key to my cards is that they need to be quick and simple!! I don't have much time with a newborn and a toddler. Because this ribbon is stunning, it helps make "quick and easy" look FAB! When I got the ribbon in the mail, I quickly took out my Christmas stash and headed straight for my American Crafts 'Hollyday' collection. I fell in love with the snowman - don't you just love him? 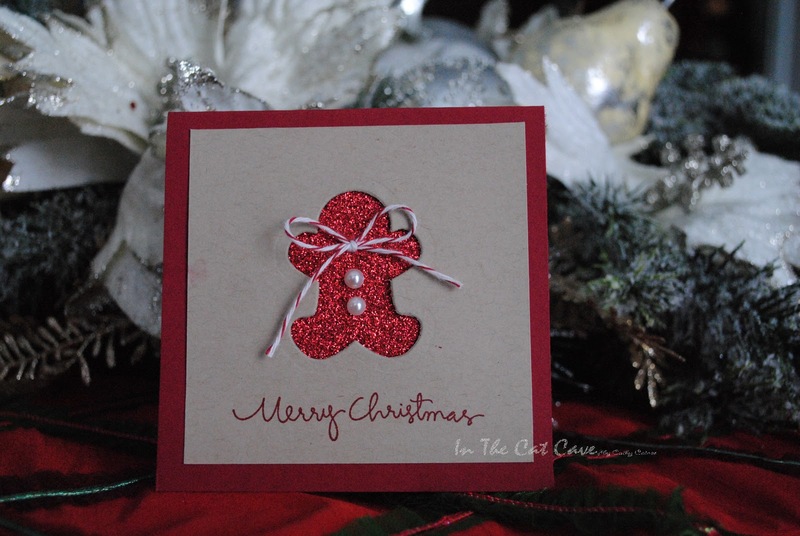 The red ribbon is the perfect accent popping right off the page! 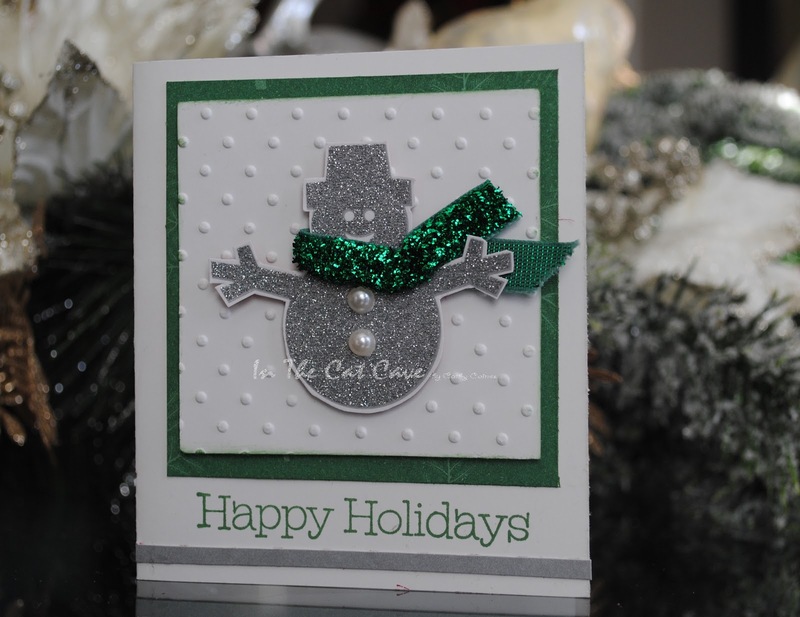 I loved the snowman so much that I wanted to do a 4x4" card just for him. I played around a little bit and decided to give the snowman a glittery scarf. 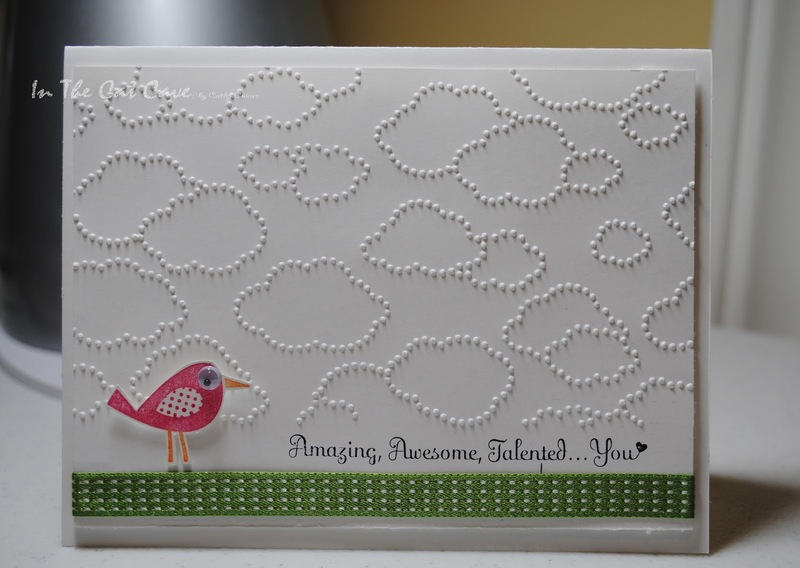 I also gave this card a bit more pizzazz by embossing the background with the 'perfect polka dots' embossing folder from Stampin' Up, making it look like it is snowing! My mind started to wonder on the third card thinking about all the glitter and sparkle. 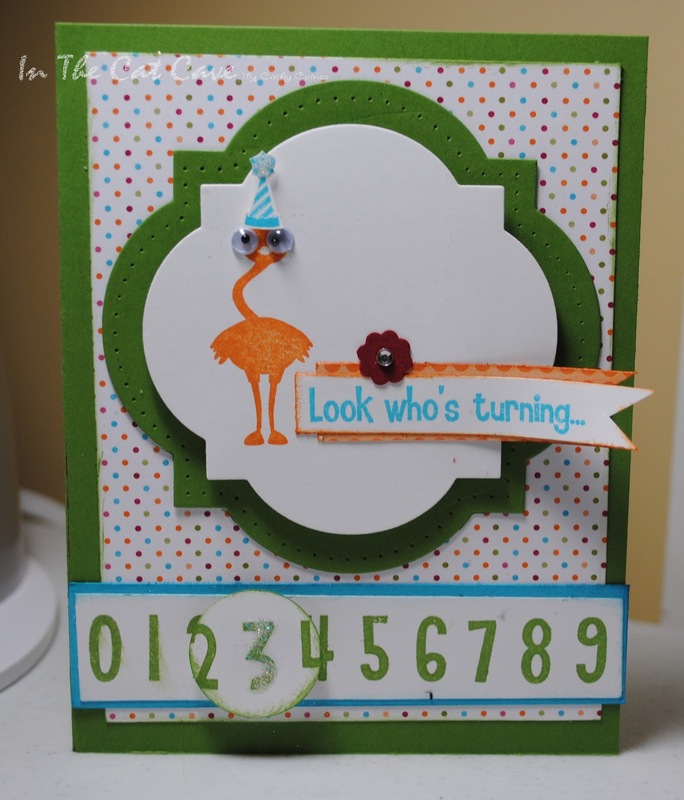 This card shows the simplicity of a quick stamped image (Stampin' Up's Evergreen stamp set). It also showcases the versatility of this ribbon! 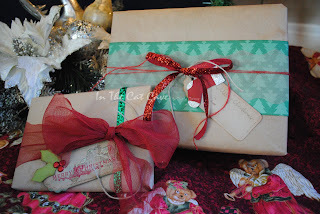 With a long to do list and packages arriving daily, I thought about the many presents that needed to be wrapped and how I refuse to leave it last minute this year!!! 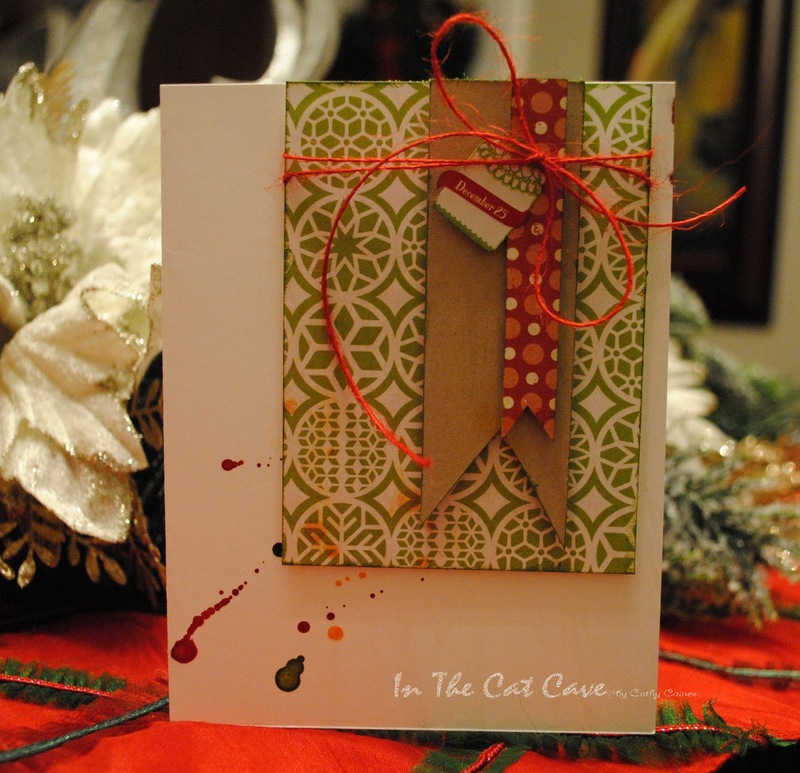 This was the inspiration for this simple yet pretty card. Enjoy! I still had a little bit of ribbon left and I didn't want to stop there. I grabbed my kraft paper, tulle, AC jute and wrapped a couple presents. I topped it off with some American Crafts glitter ribbon to give it the pop it needs. Don't you love how they turned out? Keep hopping along - up next is Stephanie!! If you were dropping into the Cat Cave and wanted to join in on the fun - see the information below! 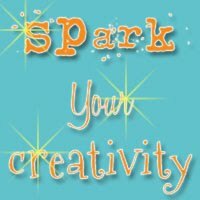 RAK ALERT - Follow my blog and make a comment on this post to enter. Already follow? You are eligible too - leave a comment and let me know! I will draw for the prize on Sunday, December 16th. Come back and check out if you are a winner! 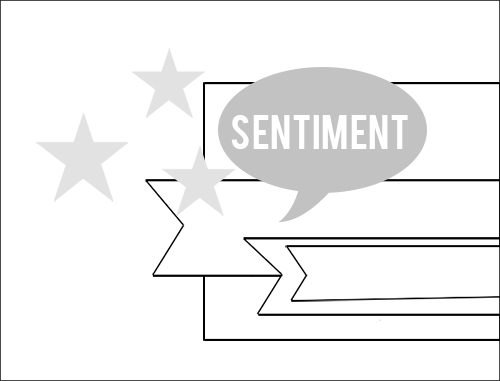 You have until 11:59MST on Friday, December 14th to make your comment. Have a great time hopping! Good luck and enjoy! Did I mention its my birthday??? For my gift from my family I get the day to spend how I want!!! Its a dreammmm! 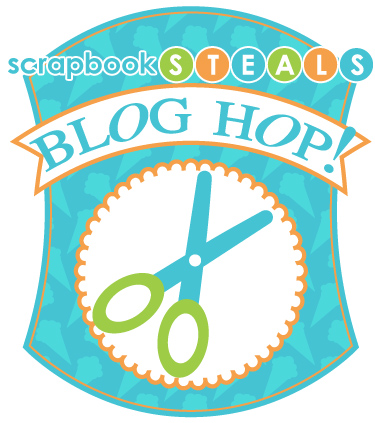 I've done a couple projects already, largely for the Scrapbook Steals Blog Hop that I am participating in. STAY TUNED FOR TOMORROW.. there might be a prize in store! Supplies Used: MME 6x6 Lost and Found paper pad, Stampin Up Old Olive ribbon, Stampin Up linen thread, MME Wonderland stamp, SU dazzling details (cherry cobbler, SU very vanilla card stock, and SU basic pearls. And here's the sketch that went along with it! This is a project that I have been working on for a few weeks and finally finished it off for December 1st... just in the nick of time! Not because it takes this long but because I was only picking away at it as I finally brought my son into the world. Unfortunately I hadn't documented until now! Let's get started!! 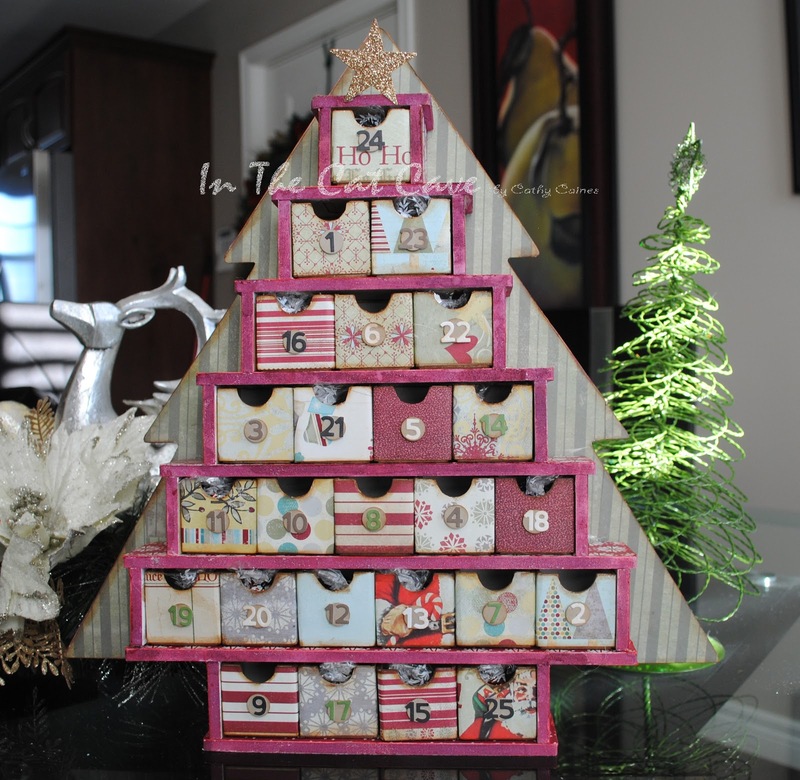 I picked up this Kaisercraft advent calendar for my daughter and I have since picked up a similar one for my newborn son. Here's the pieces! Next, I painted all the edges with an acrylic white paint, over that I put Tim Holtz distress ink.. firebrick red!! I love how this gives uneven shades. Keeping in mind that although this appears put together in the picture, it's actually only laid together - in other words, there's no glue and it will topple over!! This is necessary to get into all the grooves when covering everything with paper. The next step is to pick out the paper - I decided to go with the FancyPants Saint Nick's collection - love, love, love!! I then covered the back tree. You'll see there's a couple colors but that's only because I ran out of paper - its the same shade so it works. I then started putting paper on the "benches" that link together to created the "shelves". I glued this on using tombeau glue. Once the glue dried, I sanded the edges to smooth out the paper and applied the Tim Holtz red seasonal distress ink to color the edges. Note that you will need to take an x-acto knife to cut out the 'slots' where the shelves link together. Once this was dry, I started to glue everything together one piece at a time. I used fabric/wood glue but there's lots out there as long as it works on glue. Take all 25 boxes and begin to cut strips of paper to fit the box. glue in place using the tombeau glue. Sand and distress the edges of each box. I struggled to figure out how I was going to set the numbers but in the end I settled on the jillibean alphabeans. I used a 1 inch circle popped off each "drawer" and put on a number. I have yet to seal this calendar but I would recommend either mod podge or a sealant. 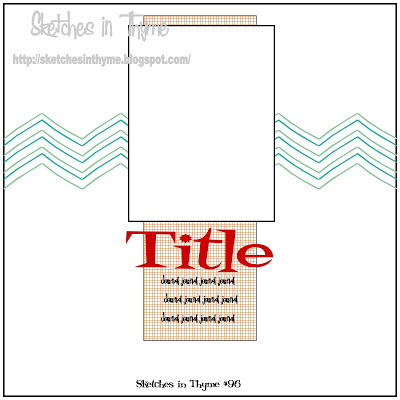 I've submitted this layout to "Spark Your Creativity" challenge on the Pin and Tack Blog. You have until December 31st to do your own project. It's 'anything goes'! Cheers!